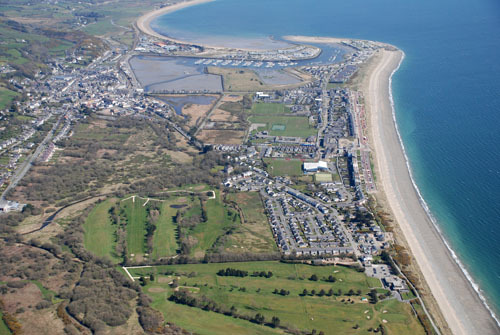 Pwllheli is an example of a medieval borough and commotal capital that developed into a regional market town and seaside resort. Its coastal location with good harbour facilities and long sandy beaches was instrumental in its foundation and later success. Agriculture, fishing and trade were dominant until the 19th century when ship building became significant. In the early 20th century the seaside resort replaced ship building as the principal element in the economy. The resident population has never been high, and is currently below 4,000. It was not until 1801 that it rose to above 1,000 and during the height of the ship building industry in the mid-19th century the population was approximately 2,500. The history of the town is reflected in its topography and buildings. The medieval remains are of particular significance. The medieval origins are reflected more clearly in the layout of the old town than in the standing buildings, of which the earliest are 17th century in date. The complex junction where the lower High Street meets the upper High Street, Kingshead Street and Penlan Street was the centre of the medieval town, which developed west along the High Street, and south towards the quays. Kingshead Street and North Street formed a triangle around the earlier medieval harbour to the north. Reclamation and harbour works have resulted in the original function of these streets being lost, and all are now land-locked. This has resulted in a feeling of dislocation in areas of Pwllheli, particularly for example at the lower end of the High Street and its junction with Sand Street, and also at the lower end of New Street. There is little doubt that the successive phases of reclamation, combined with the extension of the railway, have presented a series of difficult planning issues. These particularly reflect the need to link the old with the new in a more coherent manner. This might be best achieved by acknowledging and enhancing the differences in style that occur at the lower ends of High Street, Penlan Street and Gaol Street, though traffic management is also problematic in these areas, as the principal through route runs along the end of them all. The earlier routes into and out of the town changed after the reclamation of 1811. Two early routes – Llŷn Street and Kingshead Street – retain their original narrow width and variety of style. They have not become the focus of modern industry or out of town shopping, and this is because they ceased to function as through-routes, and neither is easily accessible by car. They therefore retain a much earlier character. It is important to manage this by respecting the existing built heritage, by ensuring future developments are appropriate in scale, and by careful selection of street furniture. The High Street also has a particular character of its own, with a wide variety of styles reflecting the economic growth of the town from the 18th century through to 1900. Later buildings exist, including the Woolworths store, but it is the earlier buildings that are dominant, and in particular the eclectic use of classical motifs on the upper façade. It is important that future renovation works retain and enhance the style and scale of the existing buildings. The former market place has, unfortunately, lost some of its earlier character, partly because it is no longer the market place. However, the buildings still largely survive, and careful management and renovation of the currently redundant buildings could retrieve the situation. The landscapes of the ‘new town’ at West End, South Beach and Cardiff Road provide a completely different character to that of the old town. This is a good example of a planned resort, and it is important to retain, where possible, the open, resort ambience that Andrews successfully achieved. Although maintenance of the houses along the West End promenade must be problematic, they provide an excellent example of seaside development by someone operating at the forefront of Welsh commerce and industry, and who was responsible for the construction of several iconic buildings within the nation’s capital. Constant maintenance of the houses fronting the promenade has resulted in the loss of some original features, but sufficient remains to retain much of their original character. The inclusion of West End and South Beach in a conservation area would ensure this important landscape and the buildings within it are managed sympathetically.